It was a rather rude alarm that woke me up early in the morning to have my saree draped the morning after the Sangeet. It was a little hard to believe that the amazing day before was really just a warm-up to the real festivities. This was the actual wedding day and it was time for everyone to put on their brightest and finest. 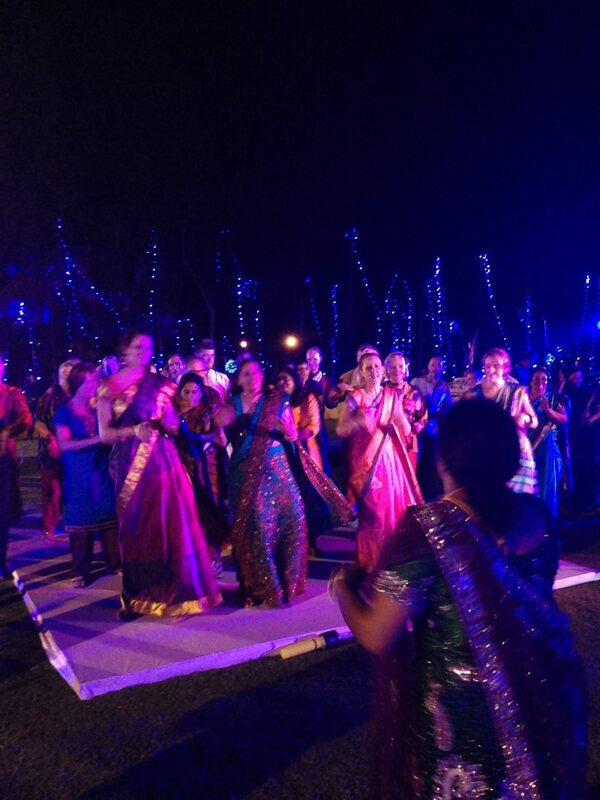 As there were so many international guests, the family had thoughtfully arranged for professional saree drapers to help everyone get ready. 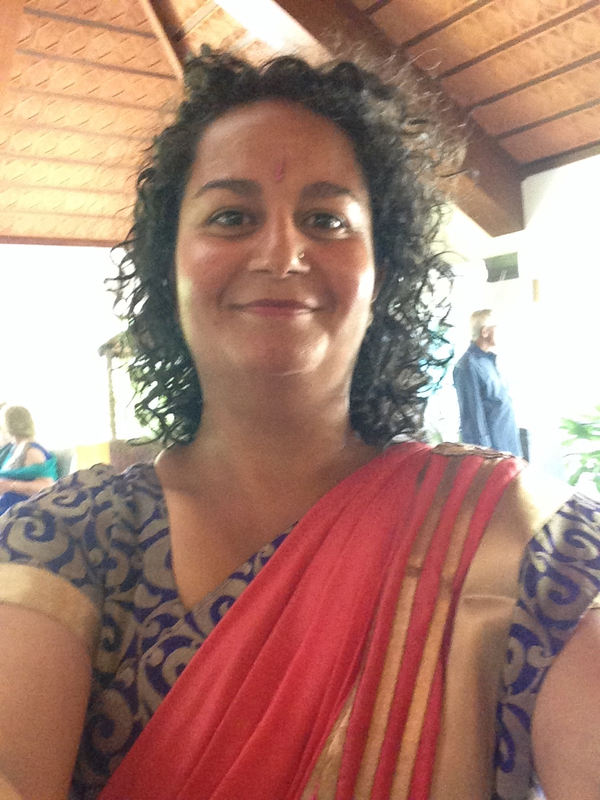 It was actually quite fun to hang around in my blouse and petticoat, bonding with the other guests over silk and bindis while we watched two ladies transform each of us into an Indian goddess. There really is something about the saree that makes everyone look elegant and composed. I think it’s one of the most graceful outfits, even if I do need a dozen safety pins to hold mine together. The day began with the groom getting a case of cold feet. He takes his umbrella and starts heading towards Varanasi to make a pilgrimage, deciding that perhaps he is more suited to ascetic life. Thankfully Uma’s father steps in and reminds him that his daughter is truly a worthy companion for life so he turns around, heading back to the ceremony. Of course this is just a fun ritual and thankfully not a real case of cold feet. There was a short delay while the bride was traditionally late. Coming down the corridor flanked by her “special ladies” she was certainly worth the wait. She looked strikingly beautiful, and just look at the attention to detail. The Malai Mathal was the next ceremony which is another fun one. First both the bride and groom are lifted up by their male relatives. It’s a sign by the family to show they will continue to support them after marriage. They then put garlands on each other, but in the spirit of jest they pretend to try and avoid each other just a little. This symbolises the joining of their lives and their acceptance of each other. The couple then proceed to the Swing ceremony or Oonjal. It’s the first time that they are seated next to each other. The family gathers around and sings and they are given sweet treats to eat. 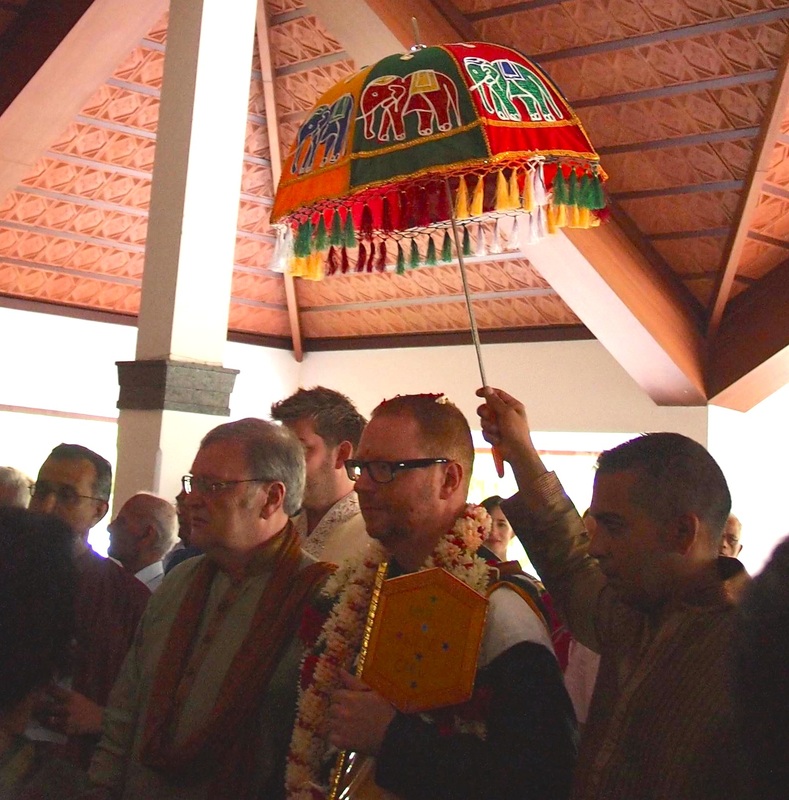 Moving into the main wedding hall, the next stage of the ceremony was a fertility rite. Seeds are sown into earthen pots by family members. These seeds will sprout into grains which are then released into a river after the ceremony. This is done to invoke the angels who will bless the couple with good health and of course plenty of children to look after them into old age. The giving away of the bride is quite common in christian weddings, and there are similar principles at play for the Kanya Danam ceremony. Here Uma sits on her father’s lap and he gives her to Carl. A ring of grass is placed on her head, and then a yoke, on which is placed a gold necklace called a mangalsutra. The meaning behind this is quite rural, where it took more than one bull to pull a cart, so in marriage you need two people to make the marriage work and move forward. Gifts are given to Uma along with blessings from Carl’s family. After this the bride is given away by her father and the groom agrees to look after her and remain her faithful companion. The next ceremony is Kankana Dhaarana and involves the bride and groom tying string around each other’s wrists which signals them being bound together. The most important knot tying ceremony is the Mangalya Dharanam which is timed to ensure it occurs at an auspicious hour that has been determined by the priests and the family. This is where the groom puts the golden necklace around the bride’s neck along with a turmeric thread which has three knots tied in it by both the groom and members of his family. The next ritual is by far the most important in a TamBrahm wedding. It is called Sapth Padhi or Seven Steps, and is where the bride and groom walk around a holy fire seven times. With each step they make a vow and are considered married once they have completed this ritual. The families exchange gifts and then the couple pay worship to the God of Fire, Agni, who is witness to their marriage. The bride offers puffed rice and food, with the help of brother, to ensure that there is always sustenance on their table. Once this is complete the bride then symbolically leaves her family and enters the home of her husband’s family. The priest and guests bless the couple and wish them well. Of course, no wedding is complete without a feast. A traditional TamBrahm wedding ends with a hearty banquet served on banana leaves in a large hall or open space. Guests are seated at long tables and waiters bring around a multitude of traditional dishes to be eaten by hand. It’s not meant to be a formal sit-down affair, but rather a quick feed for the guests. Needless to say, it may have been quick but the food was just delicious, all my favourite South Indian fare was there. The waiters also just keep coming around with more until you have had your fill. Thankfully there was a little recovery time until the big finale, the reception! For the reception, the grounds were lit up in shades of cobalt blue that I’m told could be seen from the roadside. It was like a beautiful, surreal wonderland. The event itself was a little more like a western reception, with speeches from the wedding party and words of love and affection from the bride and groom. Again the banquet was a highlight, with a grill section, a scrumptious selection of south Indian dishes and a whole area just for dessert. But we were all able to work it all off by practising our best Bollywood moves, that by now were almost in complete unison. The last day in paradise was spent chilling by the pool, laughing, having some cheeky champagnes and just enjoying the company of the new and old friends I had made here. While this was by far the most decadent and elaborate wedding I have ever attended, it was also one of the most enjoyable. It had a bit of everything; tradition, laughter, fun and of course a lot of love. I feel very privileged to have been part of it. happy time. I hope that they have a long, happy marriage. Thanks Leonie, it certainly was a great event.